DOCTORS who refuse to help terminally ill patients to kill themselves when they request to die are "genuinely wicked", a leading ethics expert has told a public debate in Belfast. 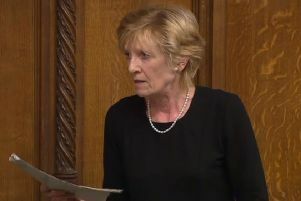 Speaking in favour of euthanasia, Baroness Mary Warnock also said that doctors and nurses should encourage terminally ill patients to decide, while still relatively healthy, whether to be helped commit suicide when they reach a seriously ill state. But last night fears were raised that doctors could be asked to become "executioners" for the old and dying. Amid unprecedented pressure for assisted suicide to be legalised, last night's debate, held in a Belfast church, is one of the first public discussions on the topic in Northern Ireland. Baroness Warnock, who last year caused worldwide controversy when she said that some dementia patients had a "duty" to seek death, said last night: "I think that people should be able to beseech their doctors, nurses to end their life when it is no longer worth living (in the patient's eyes]." Speaking of terminally ill patients who, while in good health, have made a written request to be killed when they reach a certain point in their illness, she said: "There are doctors, we know, who don't pay any attention (to those wishes to die]. "But that seems to me a genuinely wicked thing to do – to disregard what somebody had quite explicitly said, that he wants to die – not to be resuscitated in certain circumstances and in certain circumstances to be helped to commit suicide. "I believe that if someone is diagnosed as having the beginnings of Alzheimer's or dementia, at that stage it is a positive duty that doctors should talk to them about what will happen when the moment comes where they reach steep decline." Speaking of the impact that medicine-prolonged life has had, she said: "The consequence (of living longer] is financial, but much more importantly, I think of the number of people who end their life demented, unable to recognise family, unable do anything for themselves. After Baroness Warnock spoke in the debate at All Soul's Unitarian Church, Dr Idris Baker, who is a consultant in palliative medicine in Cardiff, gave a speech against euthanasia. The discussion was then opened to the floor for an extensive debate. In a vote taken at the end of the event, 32 members of the audience voted for euthanasia to remain illegal and 25 voted for a change in the law, while others abstained. One of the members of the audience, Avril Robb, a solicitor and a member of the Medical Legal Society, said that she had cared for her parents through terminal illness: "I do know that the last months were very precious. "I don't know whether it means that if this law was ever brought in, you end up with the equivalent of an executioner." Dr Sidney Lowry, former professor of oncology at Queen's University, said: "It is very difficult - there is no right or wrong. "In my experience, cancer patients don't want to die, except in extremis, but the debate seems to revolve around people with dementia who cannot make their wishes known." Hospice nurse Evelyn Uprichard, 56, who attended last night's debate, said that she opposed euthanasia but had been asked several times by patients to help them die. "I tell them that it is against my moral code and that palliative care is a preferred option – most people ask out of anger, frustration or pain," she said. A confidential survey of every GP in Northern Ireland by the British Journal of Medical Practice in 2000 found that 70 per cent of GPs would not assist someone to die. However, 70 per cent of GPs said that they would support "passive euthanasia" – withdrawing medical treatment with the deliberate intention of causing the patient's death. Speaking ahead of the debate, Lindsay Conway, secretary of the Presbyterian Board of Social Witness, said that the Bible taught that assisting people to die was wrong. "I don't support euthanasia per se and would call on Government and society to adopt other choices to alleviate suffering," he said. "But at the same time, we want to approach the issue with compassion." Stressing the important role of hospice care and pain relief, he added: "Death from our point of view is very much in God's hands." Monday night's debate was organised by the Northern Ireland Forum for Ethics in Medicine and Healthcare, a multi-disciplinary group which seeks to promote an awareness of ethical issues that arise in the delivery of health and social care. It attracts members from the disciplines of medicine, nursing, social science, law, theology, philosophy and interested lay people. The group emphasises that it was not formed for the intention of becoming a pressure group for any one viewpoint.